Hey there! I'm back today for the final day of the April Papertrey Ink countdown. Everything you've seen peeks of will be available tomorrow! I love how perfectly Splits: Get Well Soon pairs with the previously released So Striking collection! 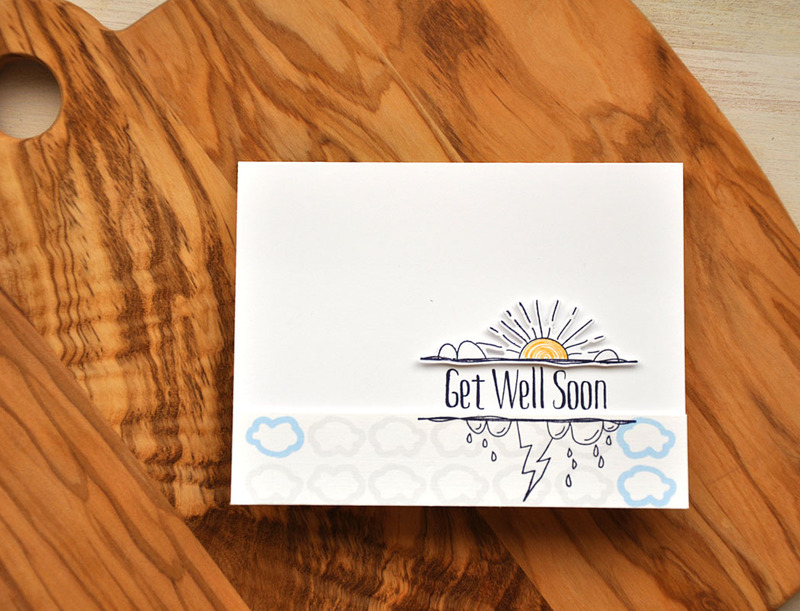 Here I've paired the bottom of the Splits: Get Well Soon frame (with the lightning bolt) with a sentiment and rain drops from the So Striking stamp set. Just a note... The sentiment here was trimmed using a paper cutter as well as by hand with scissors, this allowed me to let the letter "g" do its thing. Then that sentiment panel was attached using dimensional adhesive. 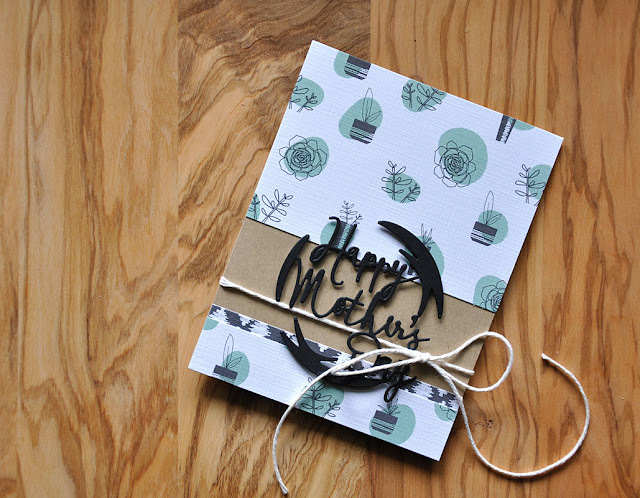 My next one features more of the Super Succulents pattern papers, stacked under a die cut black Shaped Sayings: Mother's Day. Just a note... The baker's twine was tied before I attached the die cut sentiment, I just sort of wiggled it in around the bow. I'll finish off with a look at the rest of the Super Succulents collection. 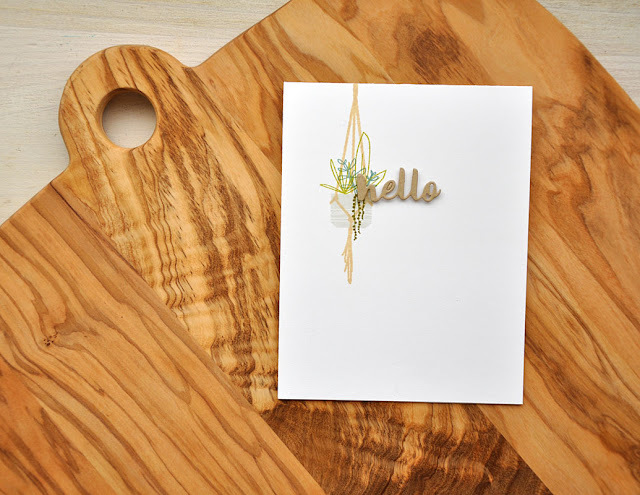 The plant hanger I showcase earlier (here) also comes in die form. And both are such fun to work with! I wiggled a few die cut succulents behind and in front of the plant hanger, creating a bit of a realistic look. This color combo includes Terracotta Tile, Simply Chartreuse, Ocean Tides, Mint Julip, and True Black. 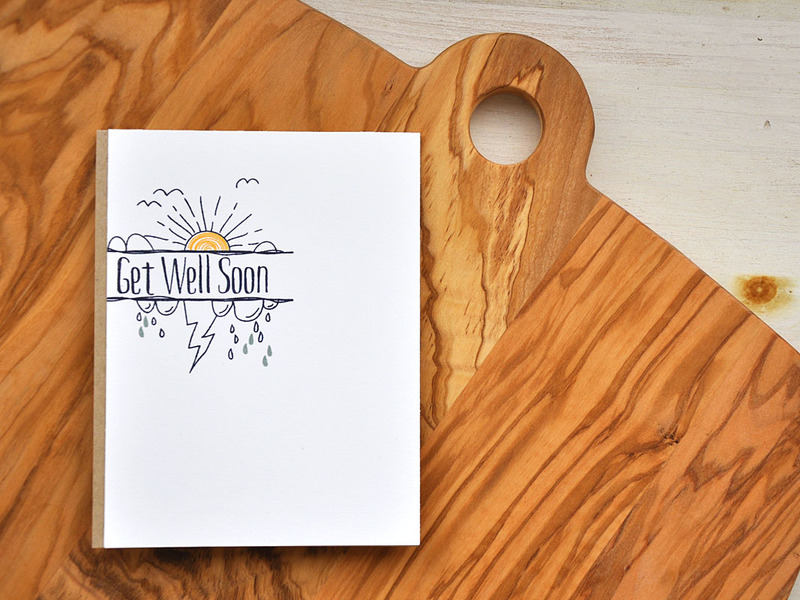 Well, there's a quick look at the Super Succulents collection and the Splits: Get Well Soon set. Just remember... all that you've seen today will be available for purchase through Papertrey Ink, beginning April 15th. 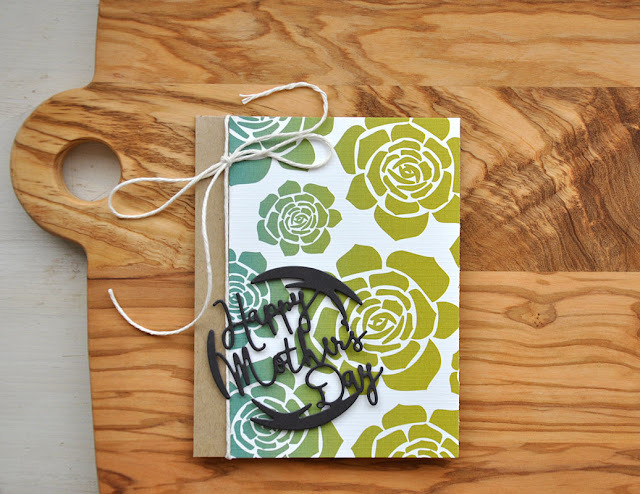 Now, be sure to visit the Papertrey Ink blog for more details on today's featured new product. Hi folks! 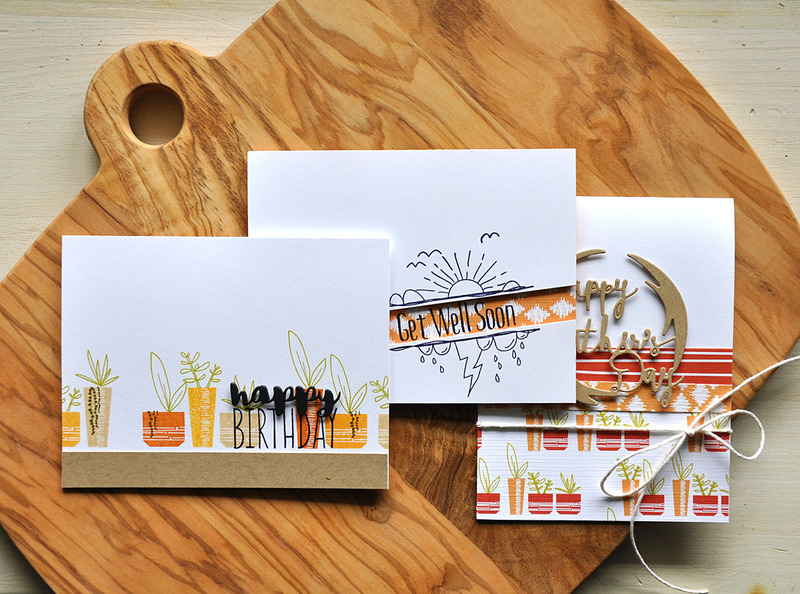 Welcome to day four of the April Papertrey Ink countdown. 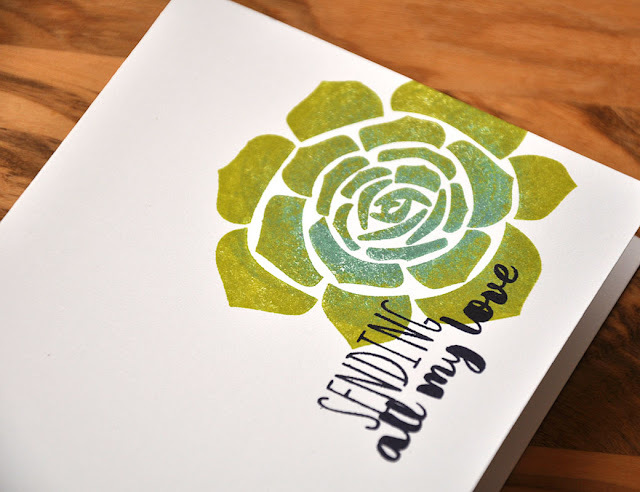 Up first, Super Succulents stamp set and coordinating die. I stamped a row of mix and matched potted plant on top of a kraft cardstock strip. Using a color combo of Fine Linen, Summer Sunrise, Orange Zest, Simply Chartreuse, and Ripe Avocado. Just a note... I used the masking technique to add the shorter bits of string of pearl succulents to the smaller pots. The sentiment was stamped in true black. For a bit of pop and dimension I attached an additional black "happy" die cut directly on top of the stamped one. 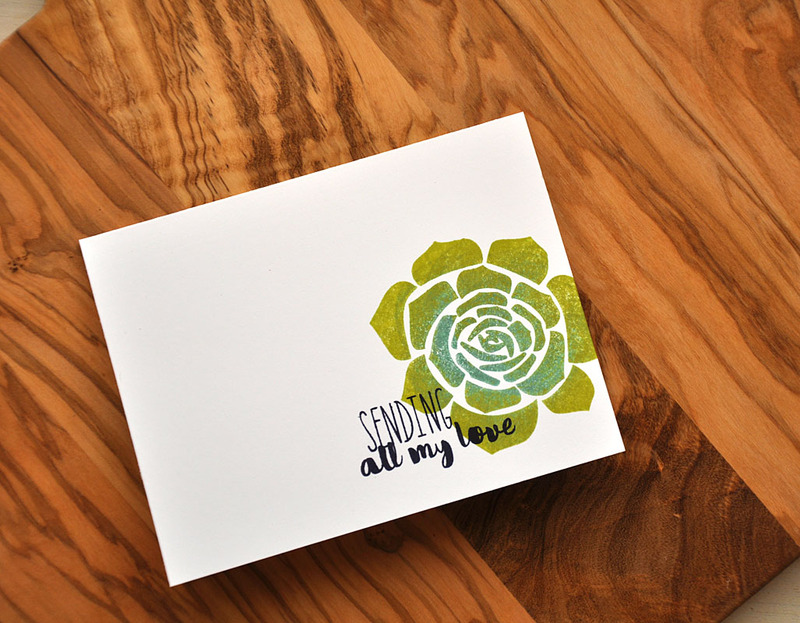 The word dies perfectly match words included in a few of the Super Succulent sentiments from the stamp set. It's a super convenient way to add a little something special to your projects. Here's another look at Splits: Get Well Soon. I stamped the frame on either side of this colorful opening in True Black. A strip of pattern paper from the Super Succulents paper pad adds the perfect pop. Last but not least... Shaped Sayings: Father's Day die. I borrowed this layout from a card I made last month, here. It's a super easy layout that lets you get good use from your pattern papers (I used the Super Succulents collection here) and any of the dies from Shaped Sayings collection. Hi! 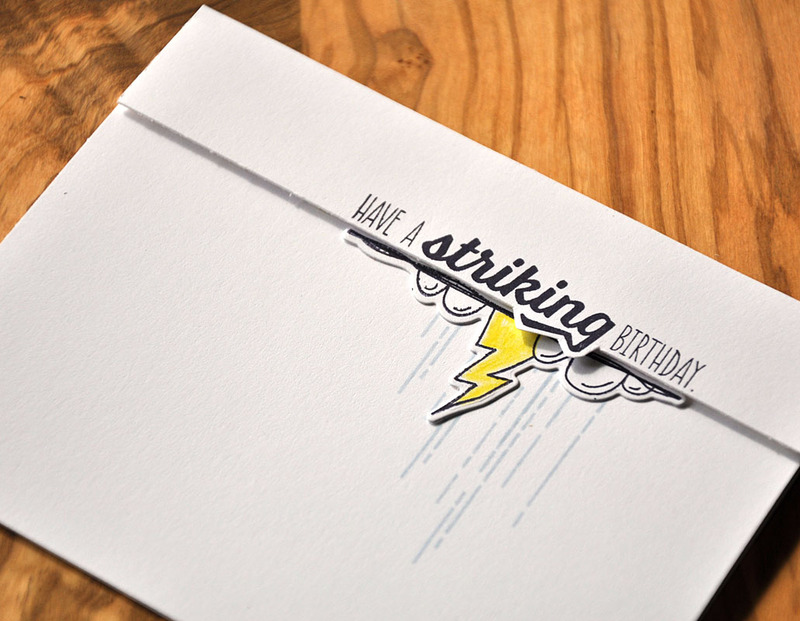 Welcome to day three of the April Papertrey Ink countdown. Today I bring you a few samples using some of my new April designs. 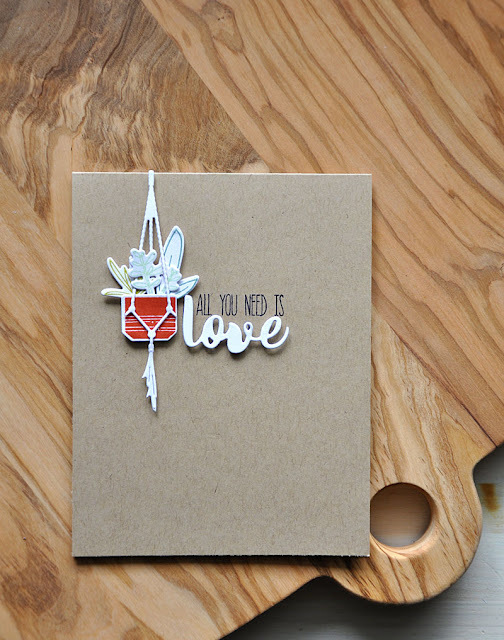 First up, the Super Succulents stamp set. Today's creations give you a better look at what is included in this set. It's chalked full of useful and fun images! With different mix and match pots and plants you'll have endless design options and color combinations at your fingertips. You can hang the pot as another fun detail too. Here's how: I created this focal point by first stamping the plant hanger in Fine Linen, I then stamped the pot in soft stone, and added the plants in a color combo of Ripe Avocado, Simply Chartreuse and Ocean Tides. 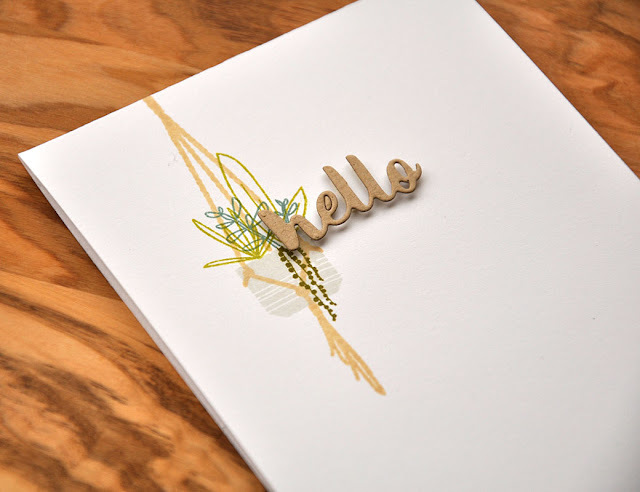 Finished it off with a "hello" die cut from the coordinating Super Succulents die set. This sentiment is also included in the stamp set too! 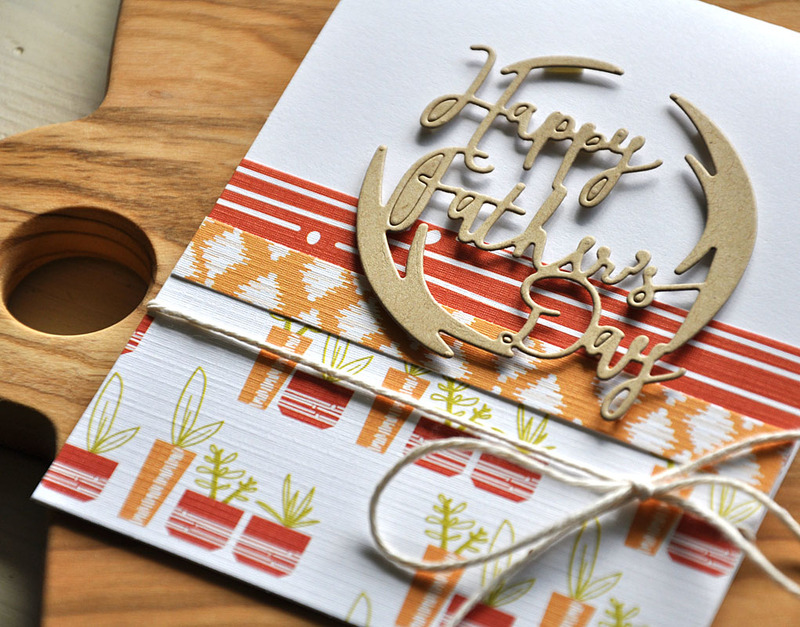 Or you can choose to go super size and stick with the extra large vines (on yesterdays card) and succulents to make backgrounds or huge focal points. This colorful and huge focal point was stamped using the rock-n-roll technique in the colors of Ocean Tides and Simply Chartreuse. It's a stunner! 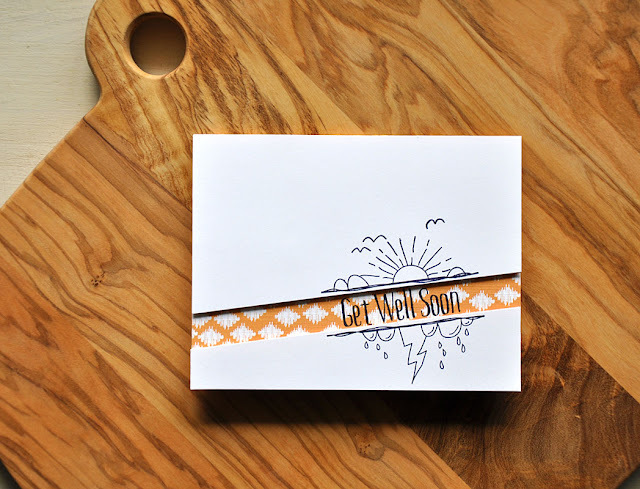 Up next I've got a cheery little sample featuring the Splits: Get Well Soon stamp set and die. 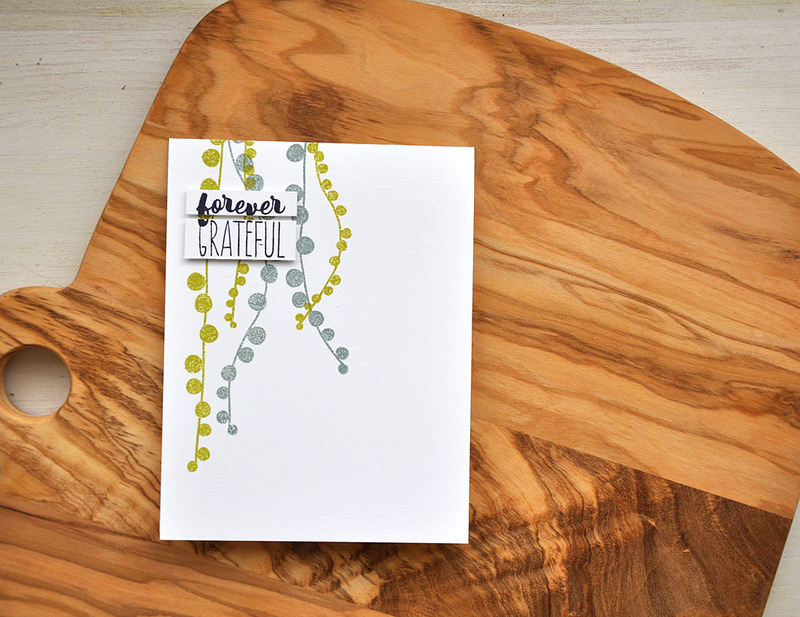 The So Striking paper pad pairs perfectly with this Splits set! 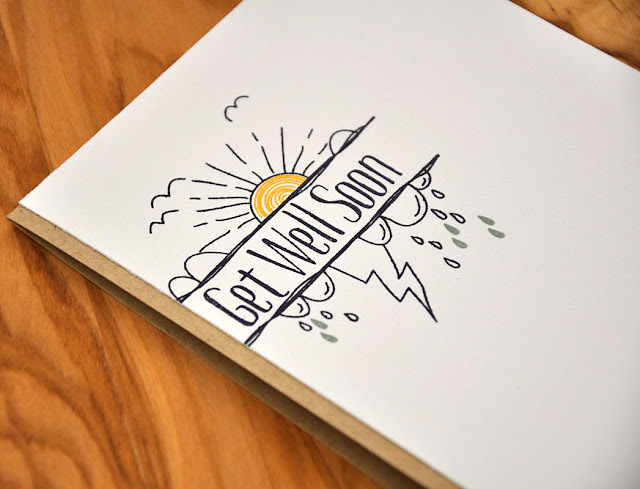 And here I've stamped the bottom portion of the Splits: Get Well Soon frame onto a strip of pattern paper from that paper pad. 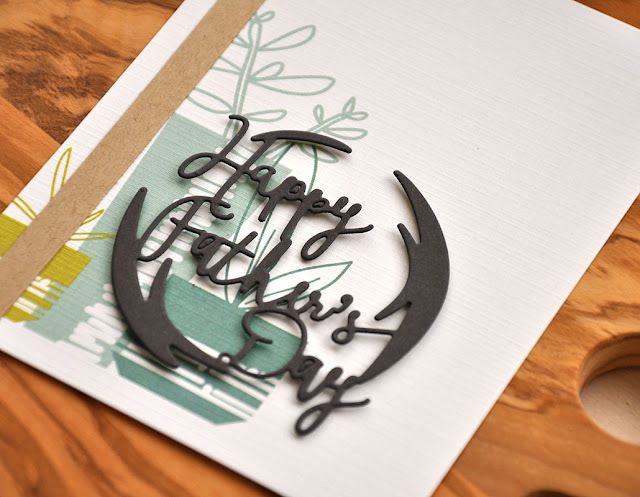 Stamped the sentiment into place just above it, and then topped that off with a stamped and trimmed top portion of the frame die cut. 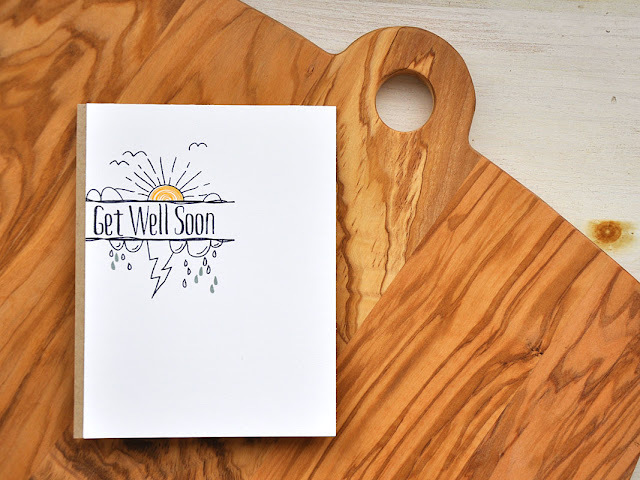 Well, there's a quick look at the Super Succulents stamp set + die and the Splits: Get Well Soon set. 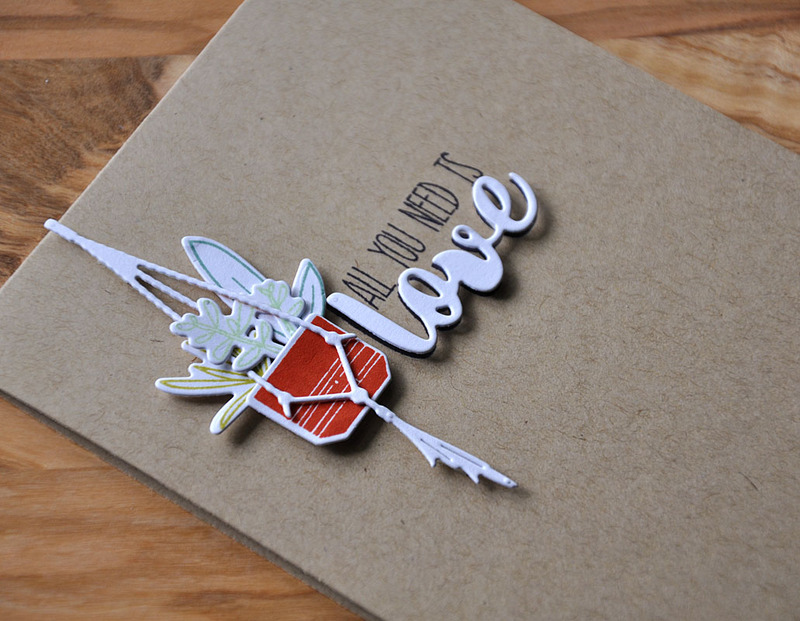 Just remember... all that you've seen today will be available for purchase through Papertrey Ink, beginning April 15th. 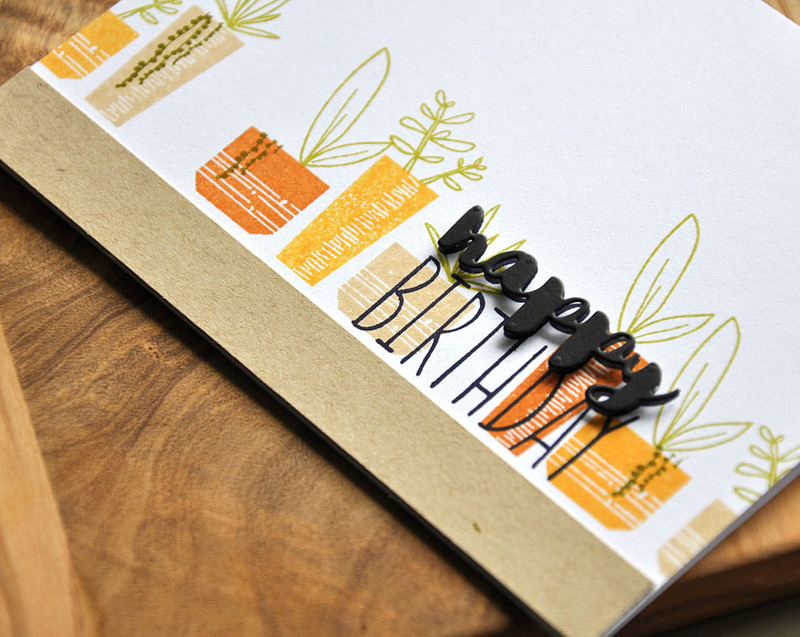 Now, be sure to visit Papertrey Ink blog for more details on these stamps and dies! Hello and welcome to day two of the April Papertrey Ink countdown! 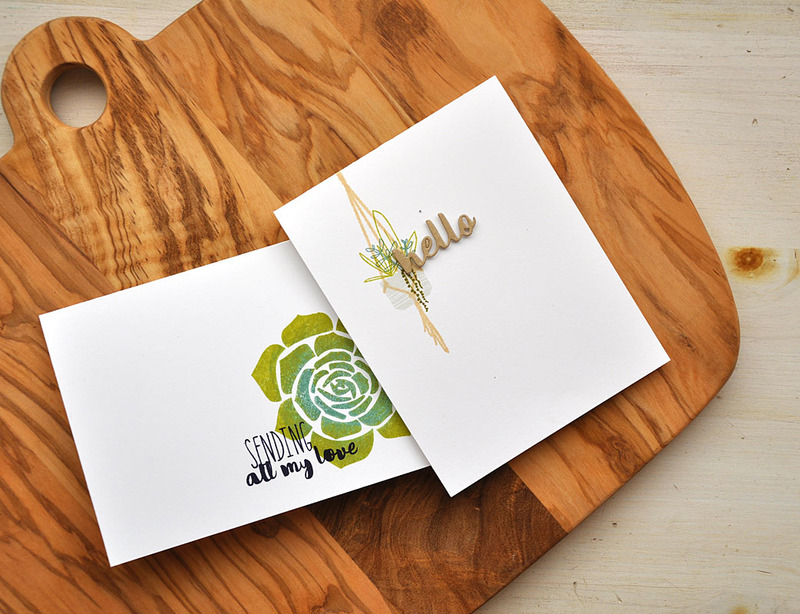 Today I'm super excited to bring you a look at the rest of what I've designed for this months release... Super Succulents stamp set + dies, Shaped Sayings: Father's Day die and Shaped Sayings: Mother's Day die. Succulents are quite the rage these days. 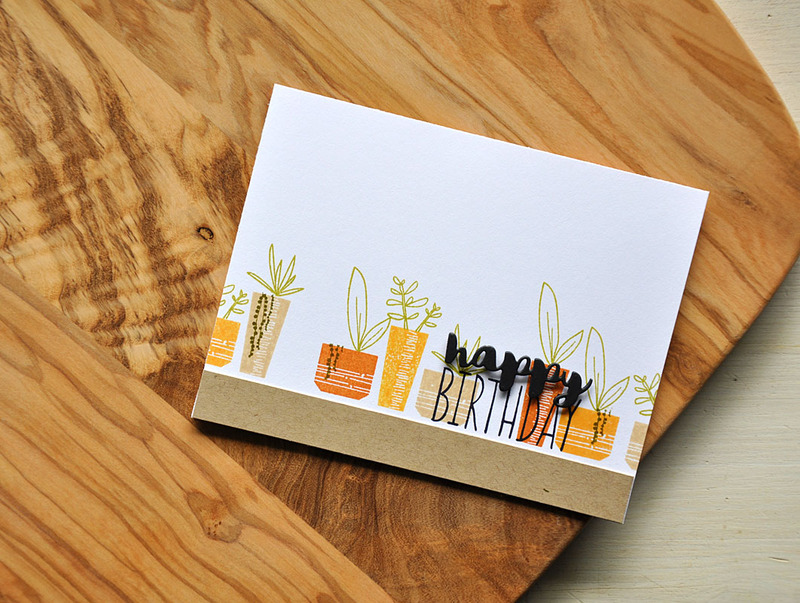 In fact, this stamp set was inspired by the very plants I have in my own home. This stamp set is full of potential! As you will see during this months release. 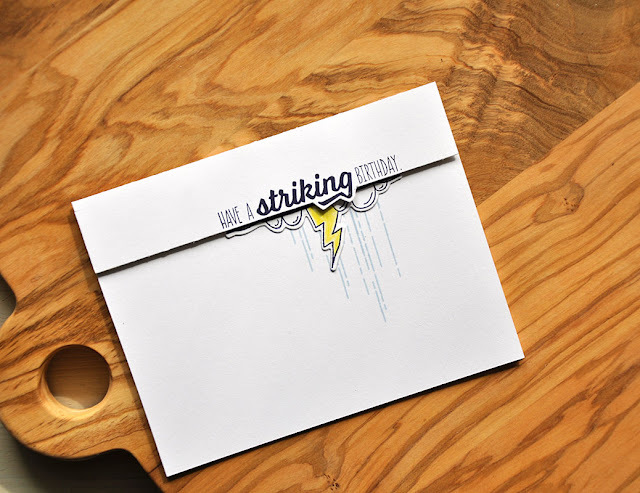 For now here's a look at the "string of pearl" succulent images, stamped in a color combo of Simply Chartreuse and Stormy Sea. These image are capable of being bent and shaped to your hearts desire, creating a perfectly unique look. 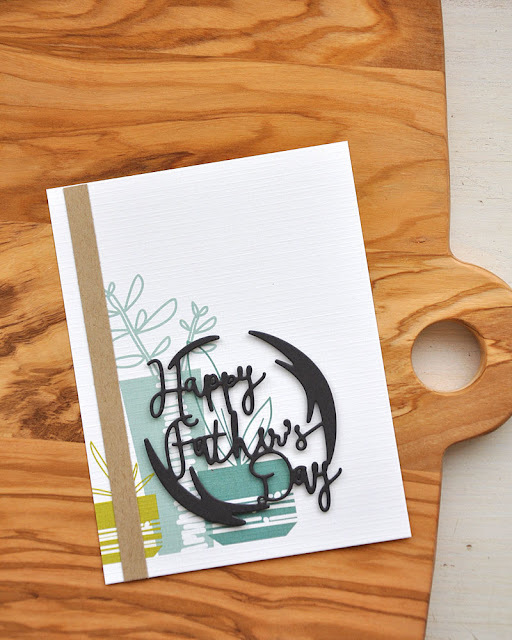 Shaped Sayings: Father's Day die and Shaped Sayings: Mother's Day die... Adding to the Shaped Sayings collection, I have created Happy Mother's Day and Father's Day versions. Here I've hidden the adhesive behind the curves and mounted it onto a sheet from the new Super Succulents pattern paper pad. Easy peasy! 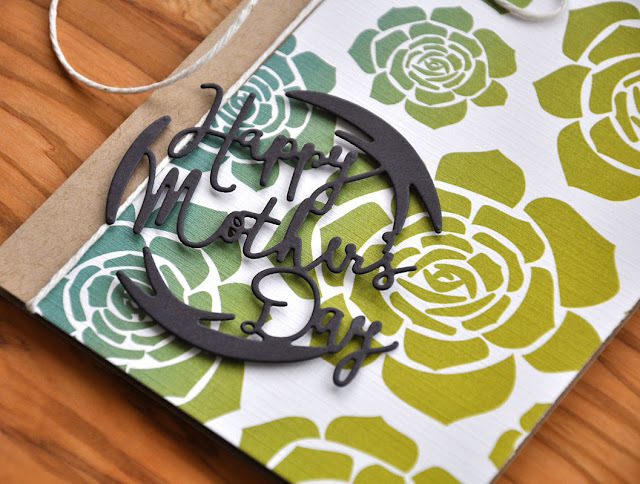 Here's one for the mother's too. This has got to be my favorite sheet from the Super Succulents pattern paper pad. This same succulent bloom image is also included in the coordinating stamp set. Oh joy! 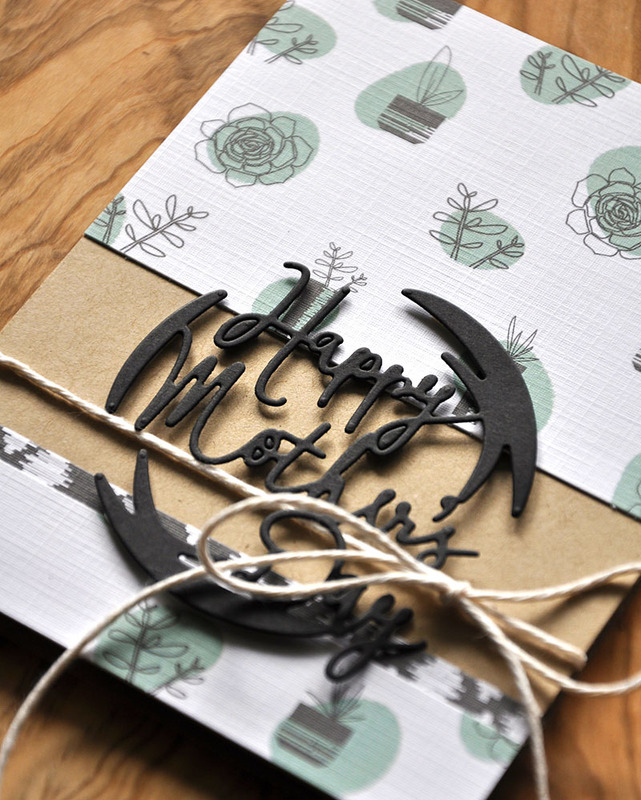 Well, there's a quick look at Super Succulents, Shaped Sayings: Mother's day die, and Shaped Sayings: Father's day die for you. 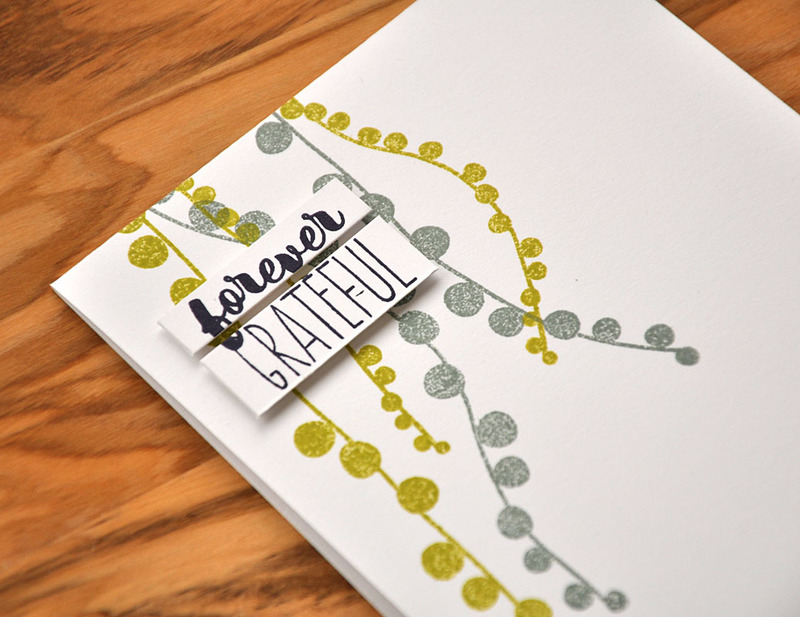 Just remember... all that you've seen today will be available for purchase through Papertrey Ink, beginning April 15th. Now, be sure to visit Papertrey Ink blog for more details on these stamps and dies!!! 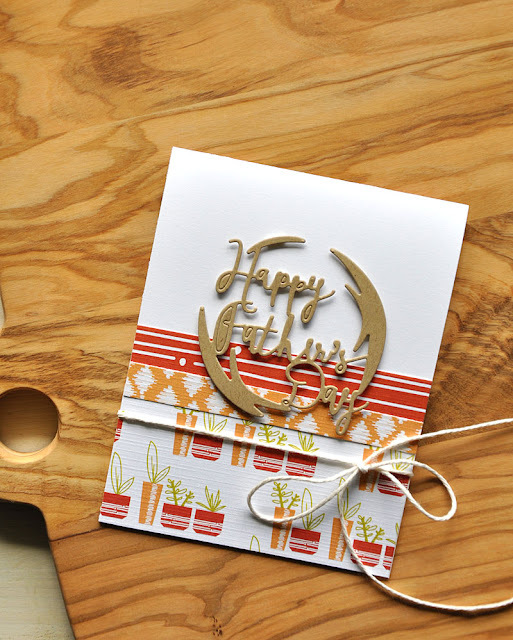 For this months release I bring you a couple of additions to my Stamping Simply lineup. But for today I'll begin with just a peek at one... Splits: Get Well Soon stamp set + die! 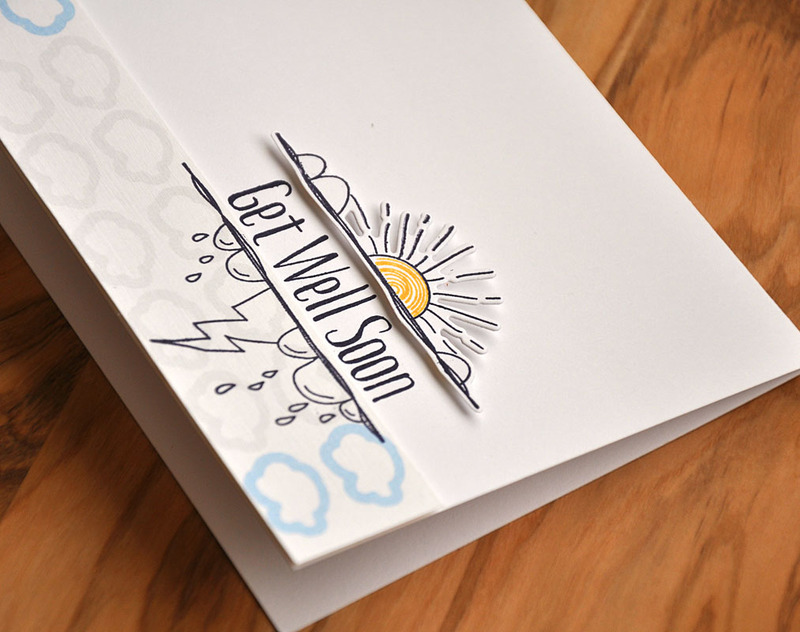 This addition is the third in the Splits series and this one features a get well theme. Complete with a sun coming out, despite the rain that can occasionally fall. Here I've simply stamped the split frame in True Black. By using the two additional small images from this set I was able to add a bit of color, a Summer Sunrise sun center and Stormy Sea rain drops. There is a coordinating Splits: Get Well Soon die, but I'll be sharing that with you all later in the release. 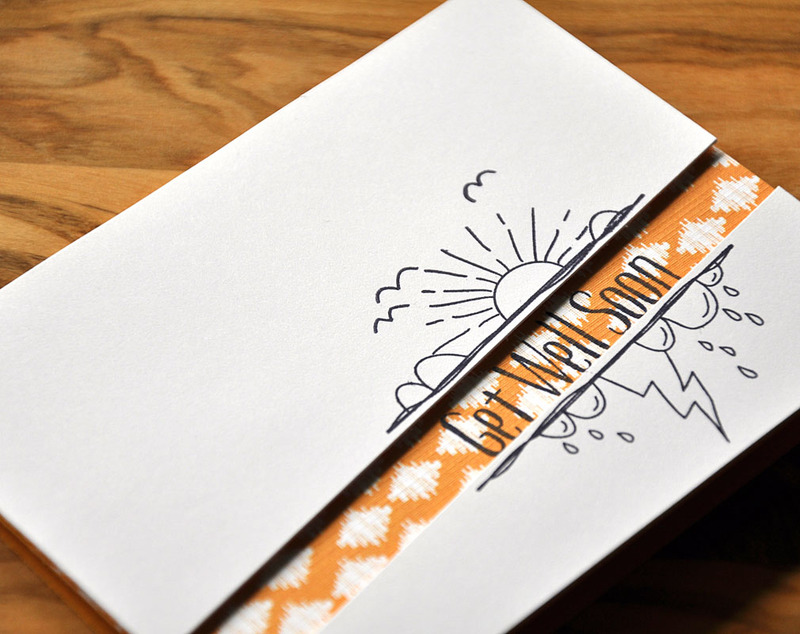 Well, there's a quick look at Splits: Get Well Soon stamp set. 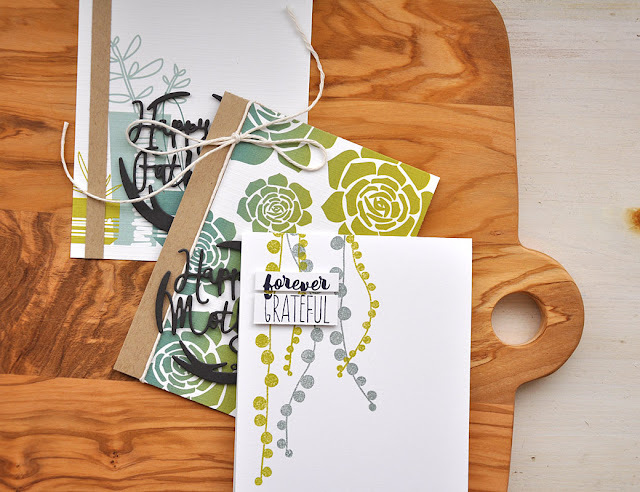 Just remember... this stamp set and it's coordinating die will be available for purchase through Papertrey Ink, beginning April 15th.